One of the things that can help manage your travel necessities is your timetable. Determining how long you’ll be on the road will assist you in packing the items that you’ll only need for the duration of your trip. If you're only traveling for a week, prepare a specific quantity of clothes and gears that's fitting for seven days. You wouldn’t be bringing a small bag if you were set to travel for a month, right? Unless you plan on washing your clothes while on transit, then carrying a small bag won’t be a good idea. As a traveler, I made sure to invest in the 28-liter Urban Camo CabinZero backpack (for short trips). Again, the process of how you’ll pack your things will still determine the space that will be used in your bag afterward. So if you need a space-saving bag, do check out CabinZero. You can read my review HERE. Don't to be the type of traveler who throws everything into the bag, so you’ll feel secure of pulling out a great line up of wardrobe and gears. If you intend to maximize the space in your backpack or suitcase, then try to be efficient. Now, if you do run out of clothes to wear, inquire about the laundry service that your accommodation may be offering, or better yet, visit a laundry shop nearby. Worst-case scenario: wash your clothes in the bathroom or buy a new souvenir shirt. It’s also important to learn about your destination’s climate, so you’ll know the weather that you’ll be experiencing. Also, check the seasons, so you’ll know what type of clothes to bring. If you intend on traveling light, then make sure you leave all of the unnecessary items. You wouldn’t want to bring a fur coat to a tropical country now, would you? If you're looking for the ultimate travel packing list, check out what we've created. Get a FREE copy HERE to download the full version in an instant! If you’ll be heading to a beach destination, then it’s fitting to pack a set of swimwear and water gears. Of course, you probably have plenty of outfit combinations lined up in your head already. However, you can still limit the number of items in your bag if you’re that keen on traveling light. So how will you plan your wardrobe then? Let's say that you'll be going on a trip for seven days. With that in mind, carrying at least 2-3 sets of clothes per day can be enough (Eg. one for sunbathing in the morning, a change of clothes, and another for socials at night). #6: Don’t fold your clothes. Roll them instead! The best tip that I’ve learned when it comes to traveling light is to ROLL YOUR CLOTHES (perfect for those who are obsessive-compulsive like me). You’re used to folding your clothes when packing them, and that's ok. However, there's a new method! By rolling each garment, you’ll get to save more space inside the bag, and get to avoid having to pull out clothes that are full of creases. You’ll also no longer need to iron your clothes afterward. Packing a towel inside your bag can add some bulk. It helps to inquire if your lodging provides free towels to guests. In this way, you'll no longer have to bring your own. Also, leaving your bath towel at home can cut the number of garments that you’ll have to launder later on. Great idea, right? How about you? 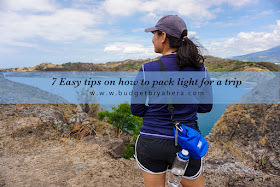 Care to share more tips on packing light?